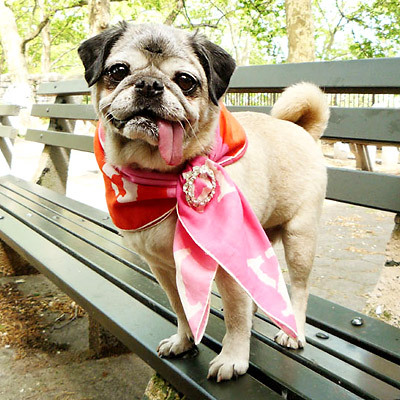 Mamma Biscuit is a senior puppy mill rescue, who spent seven years of her life caged indoors, forced to produce over 100 puppies against her will. 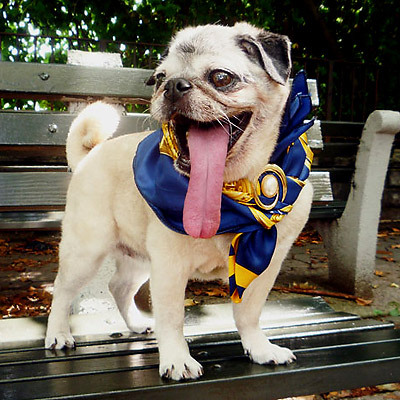 Curly Tail Pug Rescue soon came to her aid, rehabilitated her through foster care, and found her a home in New York City with John and Tommy in 2009. Since then, Mamma B has quickly become the Lady of the home. 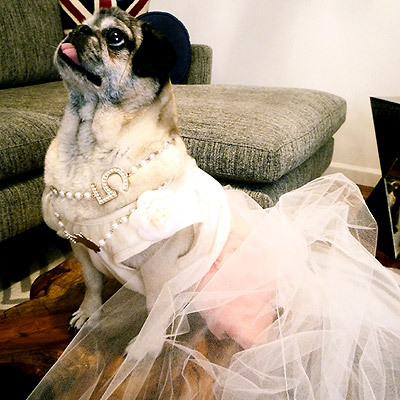 She enjoys sleeping, cuddling and giving pug kisses, and even has her own blog! 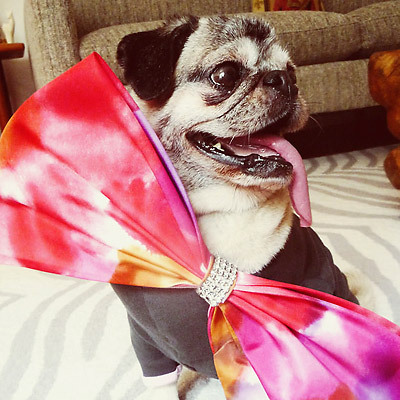 According to her Dads, when Mamma Biscuit came into their lives, “she didn’t know how to process all of the love given to her because she had never been socialized like a normal dog – she would literally stare with watery eyes.” Over time, Mamma has not only become used to the love doted on her, but has also come out of her shell fashion-wise. 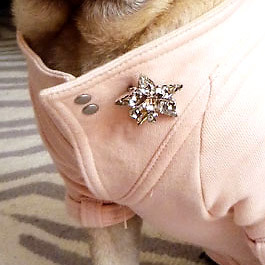 “Whenever I pull out an article of doggy clothing, she literally charges head-first into the garment,” says John. “Mamma’s style would be a unique combination of Nan Kempner, Madonna, Marilyn Monroe and Miss Piggy!” Tommy is a vegan baker, so Mamma Biscuit has to “mind her figure if she wants to wear all of the fabulous clothes in her wardrobe,” jokes John. 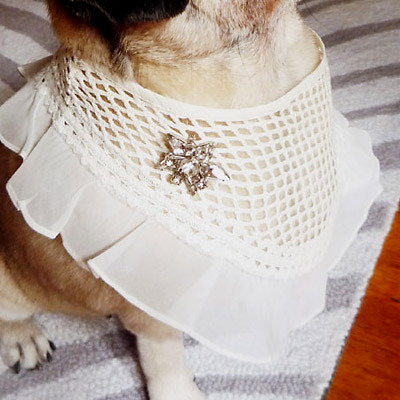 The two make all of Mamma’s outfits using found clothing, and they like to accessorize her using gorgeous vintage finds at their local flea markets. 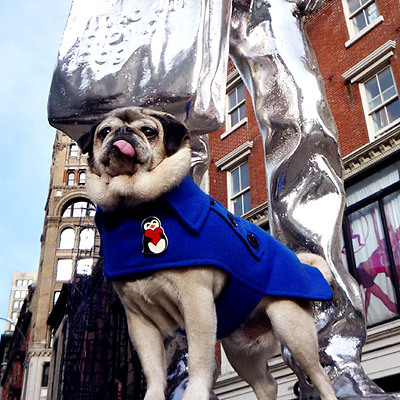 We couldn’t wait to get a few styling tips from Mamma B, hear about her top five favorite dog-friendly spots in NYC, and take a look at how she visits them in style. START THE MORNING OFF AT MADISON SQUARE PARK, WITH A VIEW OF The Empire State Building. 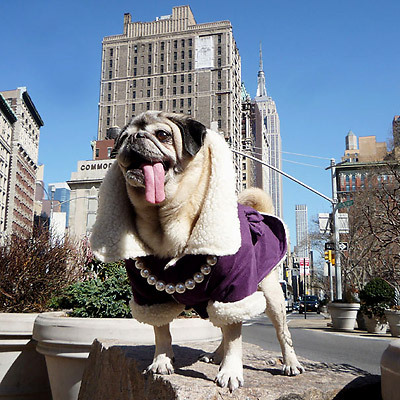 Mamma Biscuit loves to get her photo taken at Madison Square Park with the Empire State Building in the background. When the photos are done, she takes a stroll along the Manhattan streets and over to Chelsea, where she passes the famous Chelsea Hotel on 23rd Street. Mamma likes to pay respect to the many talented musicians and artists who have played and lived inside the hotel over the years. She visits flea markets in the neighborhood and likes to look for any treasures. 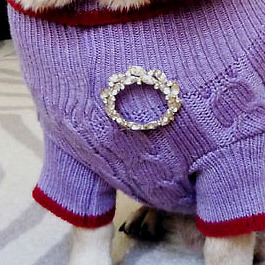 Her fancy purple micro suede winter jacket and her fancy lady pearls. venture on uptown to The Plaza Hotel. 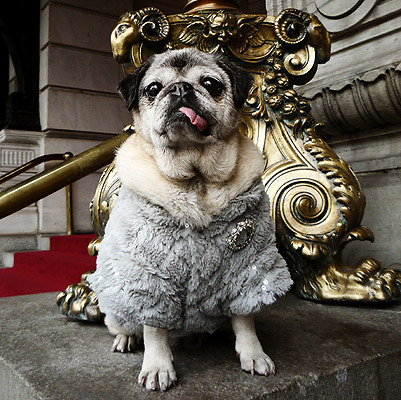 Though puppies aren’t allowed inside, Mamma just loves the elegance of the Plaza Hotel, even from the outside. She has her photograph taken by the golden banisters before checking out the Pomona, atop the Pulitzer memorial fountain just outside the front. Mamma Biscuit snaps some photographs in front of the golden equestrian statue of William Tecumseh Sherman designed by Augustus Saint-Gaudens. A faux-fur grey dress/coat paired with a vintage diamond circle brooch. If that wasn’t fabulous enough, this garment is quilted with muted silver sequin lines that add another level of sophistication! ONCE YOUR'VE VISITED THE PLAZA, CROSS THE ROAD TO Central Park and VISIT the Bethesda Terrace. Though the whole of Central Park is beautiful and fit for any pooch, the iconic Bethesda Terrace is a special sight to stop by. Rising from the Terrace is Bethesda Fountain, with the famous Angel of the Waters statue atop. Mamma Biscuit roams through the underpass, viewing the amazing walls and elegantly tiled ceilings, before checking out the intricate stone work and Gothic vignettes alongside the walls. 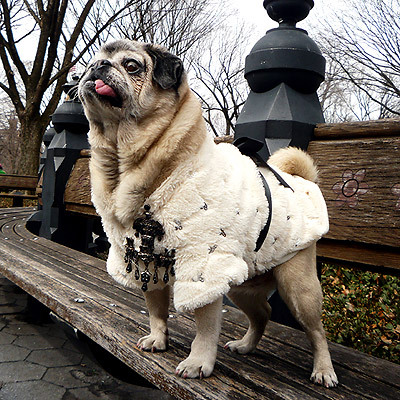 A faux mink coat with silver sequin details and a giant, black crystal chandelier brooch in spirit of the gothic architecture in the Bethesda Terrace and Fountain. WHEN LUNCH TIME ROLLS AROUND, THERE IS NO BETTER PLACE TO SIT OUTSIDE AND EAT THAN Union Square. Hanging out in Union Square is a treat for both humans and their dogs. It is one of the best places to sit and people-watch throughout the day. There is even a doggy park for the little guys to run around with friends. After eating some lunch, Mamma likes to head down to the Lower East Side and stop by Patricia Fields on the Bowery for some boutique shopping. Ink blue peacoat paired with a fun, colorful penguin brooch. 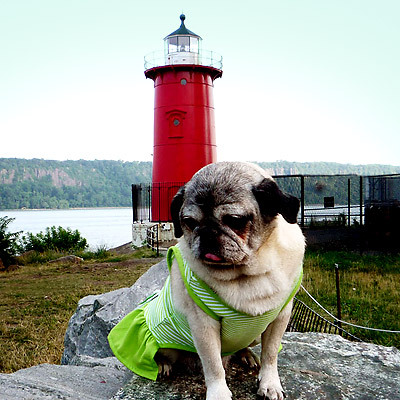 WHEN THE DAY IS OVER AND YOU'RE READY FOR A STROLL, HIT THE WEST SIDE HIGHWAY AND VISIT The Little Red Lighthouse. Not only is the book “The Little Red Lighthouse and The Great Gray Bridge” Mamma’s bed time favorite, but she just loves to visit the Little Red Lighthouse on a beautiful Spring morning. Located just under the George Washington Bridge, Mamma likes to spend some time by the lighthouse, before enjoying a stroll down the path that runs parallel to the Hudson River, all the way down to Battery Park, with a view of New Jersey just across the way. A strapless green dress, with a bow on the back – fancy party girl outfit for her 10th birthday! - The Biscuits have mastered the thrift store score, and let us in on their style secrets. 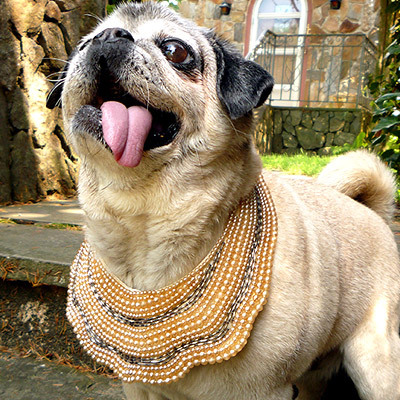 We love to use appropriate real women's jewelry because we find that jewelry or accessories made specfically for pets seem garish in style. It's all a bit too frilly and slightly infantile looking. invest in a beautiful, vintage or new brooch. Pick up a brooch from any flea market or contemporary store such as H&M. Mamma Biscuit is a girl who is between sizes, so her coats fit her in length and the fitting is adjusted around her trunk by using a brooch as a closure. Use a brooch to clasp a fun vintage hanker-chief or vintage coat collar around her neck. 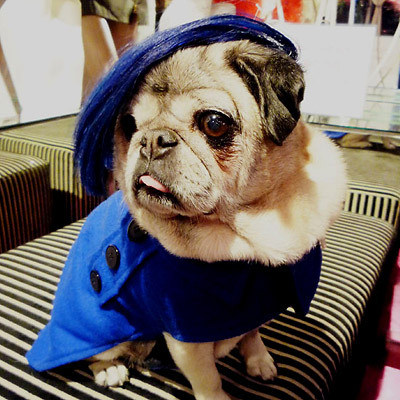 A whole 1950's look is so easy to replicate for your dog. 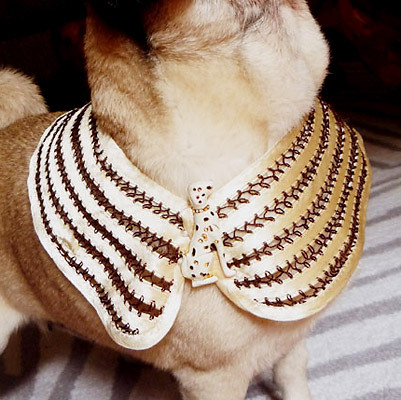 Utilizing accessories made for women is key to dog styling. 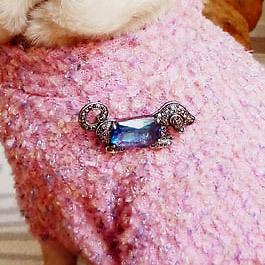 It's very easy to fold over a women's scarf until you get the right size; tie it fashionably around your pup's neck and clasp it together with a brooch. 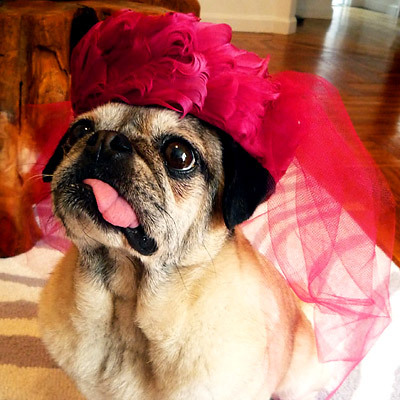 Dress your pup up with a fun hat that will turn heads. Take measurements of your dog's head with string to a ruler and surf ebay for cute doll hats. We found ours at an antique store—you can do that as well! PAY HOMAGE TO A FASHION GREAT... LIKE JOAN COLLINS. 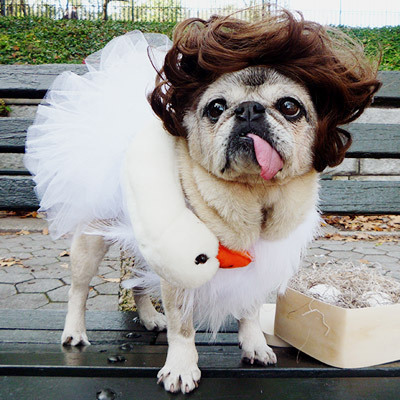 Sometimes, you want your dog to pay homage to Joan Collins as Krystle in Dynasty, because who doesn't want their dog to look like a wealthy woman from the 80's? Getting processed foods out of your fridge. This time, for our devoted canine companions. My battle with Barbie lead me to a wonderful discovery. Warning: If you don't want to be tempted to adopt, do not click on this article. Such a wonderful family do John, Tommy, and Mama make! Thank you for featuring this lovely dame who finally has what she deserves. “...literally stared with watery eyes.” Knowing the horrors of pet mills…PLEASE educate yourselves and adopt people! If you want a specific breed, find a breed RESCUE. The suffering of the innocents has to stop and it can when the demand is significantly lowered. 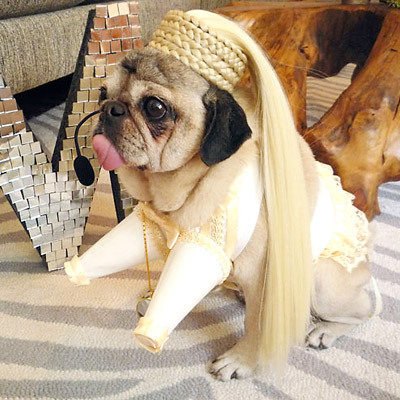 And with your Bjork Oscar ensemble, Mama…you are a triumphant of the heart!